As Christians, we all want to hear God's voice. We are His sheep, and we long to know which way our Sheppard is leading us. But, so many of us feel as if we are in life all alone. Sheppard-less sheep, wandering aimlessly without any direction at all. God has given you a very special gift - The Holy Spirit. God Says that He sent His Spirit "to be in close fellowship with you" (John 16:7 AMP). That means that God wants you to be able to hear His voice today just like Adam and Eve heard Him in the garden of Eden. This short Bible study can help you begin to hear God's voice so that you can follow where His Holy Spirit is leading you. 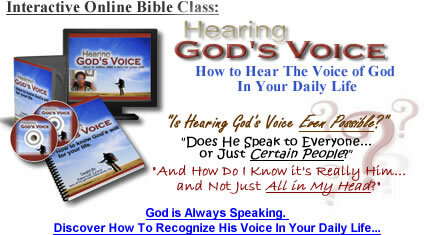 If you are looking for something a bit more in-depth, I'd recommend this powerful audio class on how you can hear the voice of God for yourself. Many times we miss out on hearing God's voice because we don't know how He speaks. Here are just a few ways that God can speak to you. Through His Word. I find that many Christians want God to speak to them, but they have not even taken the time to find out what He has already said! God has already spoken to you, and His heartfelt words are written down in the Bible. ...a mighty windstorm hit the mountain. I love the way this scripture starts off with these loud booming sounds. That is often what we expect when we are waiting to hear from God. But those loud sounds were not where God's voice was heard. God does not yell when He speaks with us. And you usually will not hear it in your natural ear. When you really hear God's voice, it will be like a whisper deep within yourself. It will not force you to obey, and is all too easy to ignore. Through a gently tug. Sometimes you actually hear God's voice, but other times you may just sense a little tug. Something inside of you senses that a particular decision is the right way to go. It's not necessarily logical, or what you would normally decide. But, for some reason, you sense a certain peace about it. This peace comes from the Holy Spirit. When you follow this peace, you can never go wrong! But, you must be sure that it is really the peace of God, and not just your emotions. Just because you are happy about something does not mean it is God's will for your life. Pray and ask God to confirm that what you are sensing is really His will for you, and not just your own. I once heard a wise Christian man say, God is always broadcasting. It is just that, sometimes, we aren't tuned in to the right channel. Here are the top 3 reasons why Christians don't hear God's voice, even though He is trying to speak. The final reason is definitely the biggest! #3. They think that prayer is a one sided conversation. Many Christians talk to God, but they never stop to hear God's voice after they are done. They simply say what is on their mind, and then go on with the rest of their day without ever stopping to listen for a reply. TIP: Whenever you pray, stop, close your eyes, and be silent for a few moments afterwards. Allow time for God to join in on your conversation ! #2. Their lives are too loud. Often times the reason that we can not hear God's voice is because we have allowed our lives to become too hectic. We have picked up too many responsibilities that God has not called us to pick up, and we have crowded Him out. We have to remember Martha and Mary. Martha was busy in the kitchen trying to prepare a nice meal for the Lord, doing what she thought was the right thing to do. But, Mary had decided to slow down and take a seat at the Lord's feet. Jesus said that while Martha was "worried and upset over all these details! There is only one thing worth being concerned about. Mary has discovered it" (Luke 10:38-42 NLT). TIP 1: Take more time out to be like Mary. Designate a particular time each day as your time with the Lord. It does not have to be long. Even 5 or 10 minutes of your lunch time spent praying in your car can quiet your life down enough to hear God's voice. Tip 2: Begin praying over all of your obligations - Even the ones that feel "mandatory." Find out which ones God has no desire for you to do, and begin trading in a busy life for a productive life that allows time for the Lord. After all, Jesus said your private life with Him is the only thing worth being concerned about anyway. #1. They doubt that what they are hearing is really the Lord, so they ignore it. This is something that most Christians are guilty of, and they don't even realize it! Just a few days ago, I had lost my driver's license. I prayed for God to show me where it was. He told me, but the place He said seemed so odd that I figured I had made it up myself! Eventually, after looking in a few other places, I did a half-hearted scan where He told me to look, and missed it. When He told me to look again, I still thought it was just me making it up. But, there it was, folded up inside of a piece of paper, buried somewhere I would have never looked! I had to laugh at myself. But, we all do these kinds of thing everyday. Then we say things like "Something told me to look there!" or "I felt like I was supposed to fill in the blank, but I didn't." Of course we all have more serious decisions to make than where to look for a diver's license. And, sometimes stepping out and following the still small voice of God can be frightening. No one wants to make a mistake, especially when there is a lot at stake. But, having faith is never easy. And that is exactly what it takes to follow the gentle leading of the Holy Spirit. TIP: Something that helped me to step out on faith and follow the voice of God was when I finally caught hold of an important fact. [I will not fear or dread or be terrified]. I finally realized that, since I was trying to be obedient, God was not going to loose His hold on me. No matter how big of a mistake that I make, if I do it because I am trying to follow Him, it is never too big for Him to fix. God is looking at your heart (1 Samuel 16:7). If it is turned towards Him, He will always protect you - Even from your mistakes. Now, another issue that many Christians struggle with is being able to tell God's leading from their own personal desires and emotions. This is something that is very important because our goal is to be Spirit lead. So, we want to be sure we are not allowing our own feelings about a matter to color the Word from God that we are receiving. Do you ever pray before you read your Bible? 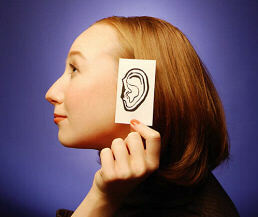 Do you think it can help you to hear from God through the scriptures more if you pray first? 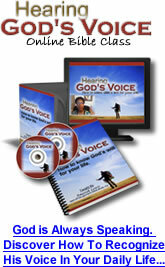 Have you ever experienced any of the top 3 reasons why Christians can't hear God's voice? If so, which ones? How can you help yourself not to fall into those traps in the future? Can you think of other reasons why Christians can't hear God's voice? In this lesson, I told a funny story about how I missed hearing God's voice. Have you ever had an experience where you thought you were hearing from God, but you were not sure? What was the experience like? 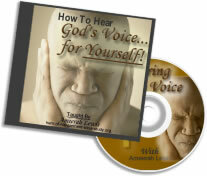 Finished learning How To Hear God's Voice?